Lola's is known as a spot that has the biggest variety of delicious martinis. They are also known for their great happy hour, when you can try their famous martinis and their appetizers at a discounted price. They also have a pool table in one of the rooms which you can play for free with your friends, so go to Lola's and have a blast. 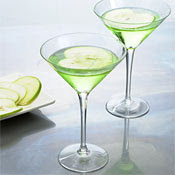 Every day, from 5:30 P.M.-7:30 P.M., enjoy $5 Martinis and $5.50 Appetizers. (Wine and Beer is also discounted). Wednesdays and Thursdays- 10:30 P.M.-12:30 A.M. Selected wine and beer is also discounted during Happy Hour. Appetizers include: Gourmet Pizzas, Spinach Artichoke Dip & Tortilla Chips, Pulled Shortrib Crostini Sandwich, Sweet Potato Fries, Empanadas, Chicken Spring Rolls and much more. Also, Lola's has "Femme Fatale Sundays" when on Sunday nights, girls get 2 for 1 Martinis. Personal Favorite: Strawberry Fields Martini that has real strawberries. I want to share with everyone all the cool dining deals and places to go that I find in the City of Angels. Many times these deals go unnoticed without people ever taking advantage of them and I want to spread the word so everyone could have the chance to enjoy them!